The plot thickens as Edward, Jane, and G are drawn into a dangerous conspiracy. With the fate of the kingdom at stake, our heroes will have to engage in some conspiring of their own. But can they pull off their plan before it’s off with their heads?. I finally managed to read another book this month, It was a huge risk I took as it is one of the hyped books and I am not finding much time to read. Luckily I loved it. I used to think that historical fictions are overloaded with information but this book change that stereotype for me. What the authors did with the story is just brilliant. All of these authors are new to me this is the first book I’ve read by these. The Writing style, story, characters, narrators everything was so impressive. Narrators were hilarious 😂 and the characters were so goofy. I loved the plot, It was way different than what I expected from a monarchy focused historical fiction. Jane and G 😍, I was totally shipping for them and their relationship is one of the most favourite parts of the story. I loved it when one character is bibliophile and Jane was literally one. Such a fun book. Glad you enjoyed it. So many quotes to choose from! Yup. I really enjoyed it too. I never thought historical fiction will be fun. Loved to get my hands on this book. I love historical fictions and this is on my tbr for so long but I still haven’t read it 😅 By the sound of its synopsis it must really be funny! I’m glad you loved it. Can’t wait to read it myself. Great review! Great review! This one definitely isn’t for me. I don’t know why but I have never been able to get into historical fiction. I’m glad you enjoyed it! Thank you, After reading this book my perspective towards historical books is changed before it I used to think that these will be overloaded with history. This sounds like a unique and fun read. This book is going on my TBR list because I keep hearing about it. And I love that there is humor in it, that quote about sleeping in a room without books cracked me up! Humor is one of the best thing of this book. I’m really not sure what to make of this book, it sounds super unique. But I’m glad you enjoyed it. I’ve had this book sitting on my shelf for so long. I’ve heard nothing but amazing things, but always hesitated to read it because I’m not really a historical fiction fan and worried it would be too much like that. I think I need to just give it a shot based on your review! I was also ignoring it despite all those positive reviews, but believe me I didn’t even remember that it is a historical fiction while reading. I’ll recommend it to you and hope you’ll enjoy it. I had my eye on this one from your last posting, and now 5 stars!! Added to the TBR. Wow. Sounds interesting. I am not a big romantic reader but I might try this book. Me neither, It wasn’t over loaded with romance so I enjoyed it. I love it when characters are really likeable. I’ve not heard of the book before, sounds great though. Lovely review. Interesting book! Not much of a fan of historical reads but your review makes this look good. This book sounds really good. I don’t know why though but I’ve always had a hard time getting into historical fiction. I had to but this one is a light and quick read. I have wanted to read this book for a while now! Cute review! I love your graphics! Have you read My Plain Jane yet? It pretty much correlates with My Lady Jane. It’s a Jane Eyre retelling. 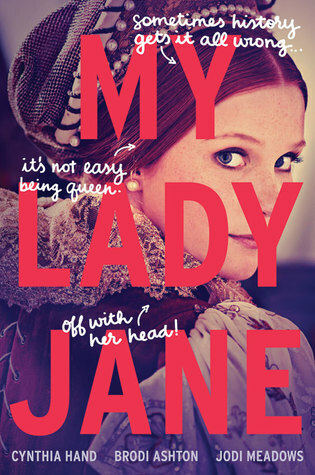 I am listening to Jane Eyre to prepare to read all these Jane Eyre retelling that are popping up! I am a fan of historical fiction but hadn’t heard of this one; thanks for sharing your thoughts! This sounds so adorable. I will watch out for htis one.